Just like most Nordic Track home treadmills, this model is also a great looking machine that comes with poor quality. 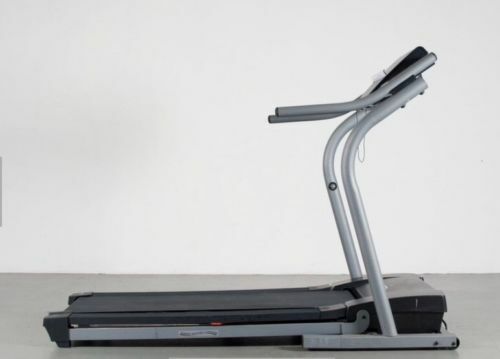 Don’t be fooled by this treadmill’s outside appearance, it may look like it’s made from quality materials but in reality they manufactured it using cheap parts. And for that, I don’t think this treadmill is a good option when you’re in the market for a treadmill below $1,000. The Nordic Track EXP 1000 XI treadmill comes with a 1.5 HP continuous-duty motor. It can reach a speed of up to 10mph which is the average for most treadmills in this price range. The patented DuraSoft™ shock absorption provides superior comfort. This durable isolator cushioning absorbs impact as your foot makes contact with the treadbelt, as a result, it helps protect the important connective tissues of your ankles, knees and hip joints. The CardioGrip™ Pulse Sensor allows you to easily workout in your target heart rate zone. You simply grip the handrail for instant, accurate heart rate data, so you can have a more effective workout. Considering its price tag, this machine has a pretty decent running deck. It is a 20-in. x 55-in treadbelt that can also be elevated up to 10% using its Power Incline™ feature. The Nordic Track EXP 1000 XI treadmill also has 5 programmed workouts, plus the option to run even more interactive workouts from CDs, videos and even the Internet with the built-in iFIT® technology. You can also store this treadmill easily with its SpaceSaver® design. When not in use, just raise the spring-loaded deck and lock it into place. It also has small wheels built into the base so you can easily push it into a closet or storage area. And finally, the motor is covered with a 3 years warranty, other parts 2 years and labor charges for a year. The frame also has a warranty for 5 years. This model’s biggest fallback is its low quality. This treadmill, just like most in the Nordic Track line, is made from cheap parts so don’t expect them to last very long. I don’t think you’ll get value for this treadmill. It comes with poor quality, and its warranties are not long enough to make up for it. So I won’t recommend buying the Nordic Track EXP 1000 XI treadmill. If you really want a treadmill below $1,000, I suggest you visit our best buy treadmills page. There, we arrange all the best treadmills for the year according to its price. If you still plan on buying a Nordic Track EXP 1000 XI treadmill, I suggest you buy it at nordictrack.com. You can get it for just $789.00.